Your inner circle of friends can have a direct impact on many areas of your life, including your financial behavior. According to a 2014 study from the Journal of Consumer Research, peers can influence you to make certain decisions. You can even bond with someone over decisions to abstain or indulge in certain activities.The study found, for instance, that friends bond over small shared indulgences like eating chocolate, but were more inclined to abstain as the stakes were raised. This person takes a lot of risks when it comes to their money. They aren't necessarily careless, they just tend to leap without looking. Sometimes they win and sometimes they lose. If you're not careful, these seasoned risk takers can take you along for a ride you're not ready for. The excessive risk-taker tends to be impulsive, and seeing them win can influence you to make similar choices. This friend may encourage you to make major decisions without properly weighing all the risks involved. Take their "bright ideas" with a grain of salt, but don't shun everything they conceive. They can be good business partners when tempered with caution. Sometimes, you won't be able to talk them out of anything, but you can definitely leverage their passion for risk taking if you find yourself being too conservative for your money goals. This friend spends every single penny that comes into their hands. They take expensive trips, show up at exclusive parties, and seem to be forever shopping and eating at fancy restaurants. In fact, whenever you two hang out it involves spending obscene amounts of money. In some ways, they could actually help you live a little. Just make sure to manage your interactions so that you don't end up in the red. If your friend suggests an outing that could cost more than you've budgeted for, suggest a more reasonable alternative. This way, you get quality time with your bff without the collateral damage to your wallet. This friend is also known as the conspiracy theory or financially "woke" friend. They always predict that the financial world as we know it will come to a terrible end. Their portfolio consists mainly of assets in precious metals, canned goods, and their homemade bomb shelter. This friend won't save or invest for tomorrow because it might not come, or will be dystopian at best. At times, they may tempt you to believe that the sky is falling and that you should do something about it. The problem is that many of their "solutions" involve ignoring sound, practical principles for the sake of events that are unlikely to happen. This friend constantly makes bad financial choices: the latest MLM scheme, lending to irresponsible people, and falling prey to a myriad money scams. This friend prefers to look for quick fixes, rather than roll up their sleeves and get their finances in order. After all, they make living life on the edge seem easy. This friend might tempt you to ignore financial responsibility or engage in the latest get-rich-scheme that's guaranteed not to work. Don't look down on them or chide them for bad choices, but definitely don't join in when they're spending recklessly in order make money fast. They won't, and you won't either. This cheapskate rarely spends money on anything or anyone. They will not spend money for gifts, events, group outings, or investment opportunities that could actually benefit them. If you're not careful, the miser can actually cost you money. Their lack of desire to pay for things can impact your plans or create unrealistic expectations around your friendship. Maybe you're expected to foot the bill or always plan the cheapest outing possible. It might cramp your style or just end up being incredibly boring! If you want to deal with this money personality without cutting them out, be patient yet motivating. Treat their hesitation to spend money gingerly. They may have endured traumatic experiences with money as a kid, or witnessed their parents making poor financial choices. Encourage them to spend money on things that matter in a way they are comfortable with. Just like money goals, maintaining healthy friendships is not easy. 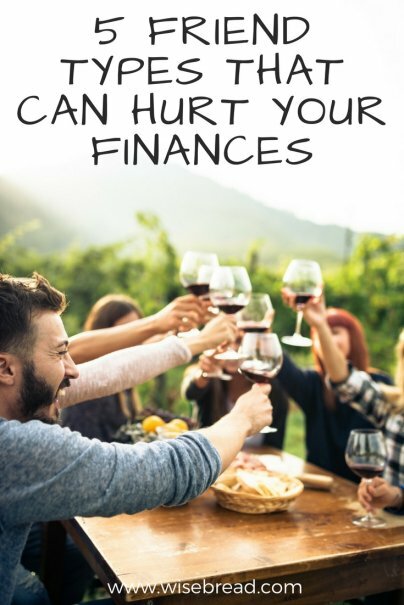 It takes a great deal of work, sacrifice, and dedication to make sure you are bonding with people you care about in a way that won't set you back financially.